Jemima Mallard is having a bad day. First two kids sank her houseboat, and now the YPD (Youth Police) think she's mixed up with a criminal called 'Father Thames'. Not even her dad, a Chief Inspector with the 'Dult Police, can help her out this time. On my list of top ten favorite things you'd find graphic novels and dry British humor (unrelated, butterscotch brownies also make an appearance). This novel has 'em both (not the brownies). When I sat down to write out this review, all I could think was middle grade Amanda would have thought This Book is Awesome. But then, adult Amanda thinks it's pretty dang awesome, too. From page one the setting--a flooded London where everyone lives and travels by boats--is effortlessly believable and fun, brought to life with the illustrations of Paul McGrory spread throughout the story.The main character, Jemima, is equal amounts of snark and cleverness, making it all too easy to love her, and also easy to see why she butts heads with the overachieving Youth Police Department Officer, Nick. The tension between the Youth Police and the 'Dult (Adult) Police is spot on, their characters perfect, but not in your face, examples of how children view adults and vice versa. 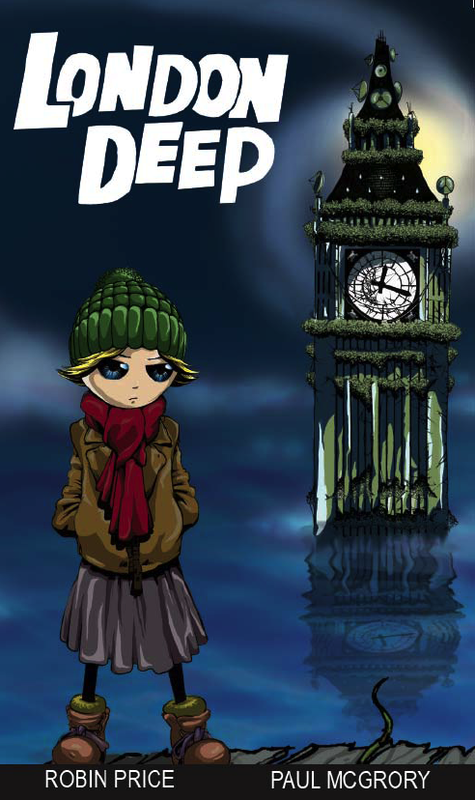 Chosen as one of Manchester's Recommended Reads for 2010, London Deep is a must read for any Middle Grade fan. This book sounds fun! And who can resist snark? What great cover art! This novel sounds right up my alley with its dry humor and setting. I'm going to have to hunt it down (and read it with a brownie ;) ). Thanks for the review!